1980 Wood rot is a common problem in homes on the North Shore of Boston, where the weather and proximity to the ocean can really batter a house. Under those conditions, newer homes are just as likely as colonial homes to suffer from wood rot. The owners of a 1980s Cape Cod style home in South Hamilton knew they had to address the water damage at the front of their house. They called upon WORKS by Jesse DeBenedictis. The WORKS team first removed siding and sheathing to determine the extent of the damage. We removed the rotted wood and made everything watertight with new insulation, sheeting and flashing. 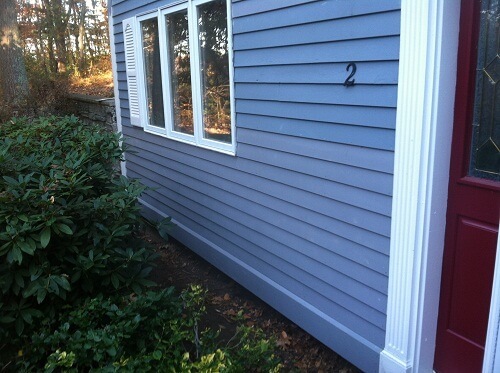 We reinstalled the corner board, shutters and trim, caulked and repainted. The owner then mentioned his aggravation with sticky storm doors on the porch. We were happy to take a look and fixed the problem by lubricating the hinges on the doors and tweeking the jambs. In addition to being licensed by the state of Massachusetts (# CS 91245 and HIC # 178604), WORKS by Jesse DeBenedictis brings over a decade of local experience to every North Shore project; Jesse himself lives on the North Shore. We have helped homeowners in Amesbury, Beverly, Boxford, Danvers, Essex, Georgetown, Gloucester, Groveland, Hamilton, Ipswich, Lynn, Lynnfield, Rowley, Marblehead, Manchester-by-the-Sea, Middleton, Nahant, Newbury, Newburyport, Peabody, Rockport, Salem, Swampscott, Topsfield, Wenham, Middleton, and West Newbury. The small town of Hamilton includes many horse farms and takes pride in its regular polo and other equestrian events. The town was part of a purchase from the Agawam Indians made by the founder of the Massachusetts Bay Colony in 1638. Hamilton was originally part of Ipswich, but was incorporated in 1793 and named after Alexander Hamilton, the first U.S. Secretary of the Treasury and founder of the Federalist Party. WORKS was respectful and I enjoyed having them! Mary about the WORKS team.